DSCN1104, originally uploaded by BenTG. Miss TT is 63 years old. She lives on General Pershing St, Ocean Springs, MS. Miss TT finally got a FEMA trailer last week, almost five months after her house was wrecked by Hurricane Katrina. Miss TT has many health problems and takes many medications. With nowhere else to live while she was waiting for her FEMA trailer, Miss TT has stayed inside her house though it filled with water duing the storm and is missing one of its walls. The mold which is in Miss TT’s house since the flooding has been exacerbating her asthma, and she is worried she may have pneumonia. Miss TT says she often has trouble breathing when she lies down to try to sleep. 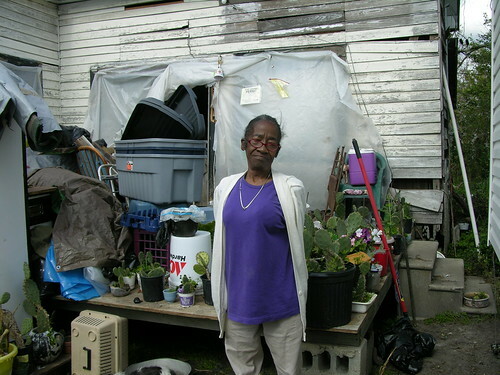 Though Miss TT finally has a FEMA trailer, she continues to live inside her moldy house. The heating system in her trailer isn’t working, and she finds it too cold to live in. Miss TT had been scheduled to have surgery for a locked bowel on the day that Katrina hit. She still has not rescheduled her surgery because she doesn’t feel she can have the surgery without a healthy environment to live in after she is released from the hospital. This is the first time I’ve had high speed internet access since I’ve been in Mississippi and Louisiana. I have a few hours here at the Rue De La Course café in the Carrollton neighborhood of New Orleans. I should now be able to deal with more of my photos and fix the ones that did not upload properly. Maybe I’ll get a little writing in, too. I expect to have some more time on-line later on this afternoon and/or tonight. The photos should make some more sense, once there are more in sequence. I will be adding some explanations after I do the initial work of getting them uploaded. The flickr tags should give you some additional clues in the meantime.